President Muhammadu Buhari says his administration will look into the constitutional 13 per cent derivation benefit to the Niger Delta region to ensure even spread of developmental projects that meet the needs of the people. President Buhari, according to a statement signed by his Senior Special Assistant on Media and Publicity Garba Shehu, made this promise on Friday when he received Isoko traditional rulers and personalities in Abuja. He assured the royal fathers that the constitutional provisions for Niger Delta development will be carefully studied for inclusiveness, especially in the prioritisation of Federal Government projects. “I will look at the constitutional 13 per cent derivation and what previous governments have done, in order to know what we can do,’’ President Buhari said. President General of the Isoko Development Union who spoke on behalf of the Isoko leaders had earlier asked President Buhari to consider some anomalies in the spread of development projects in the Niger Delta. Amadhe claimed that the Isoko community and its indigenes had been sidelined in Federal Government appointments, with the last appointment of a minister in 1975, noting that the region was also ignored in siting of federal educational institutions, skill development centres and infrastructure. 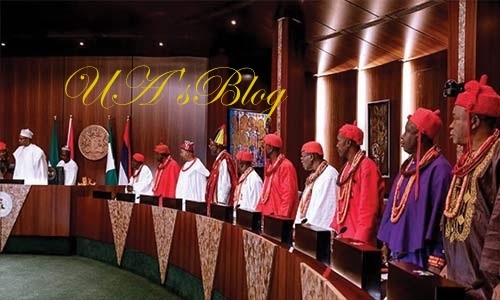 President Buhari, however, said the Isoko kingdom had very qualified citizens that have distinguished themselves in various professional and entrepreneurial skills in the country.